Stout & Teague has completed the 2nd phase of its green roof project at the United Methodist Building on Capitol Hill at 100 & 110 Maryland Avenue, NE. Approximately 7,370 square feet of roof area was covered with flowering plants. The green roofs naturally manage more than 128,000 gallons of rainwater and reduce stormwater runoff to the Anacostia River watershed. They also absorb heat which results in lower building energy usage in the warmer months. In the long term, the green roofs can potentially double the lifespan of the roofs. 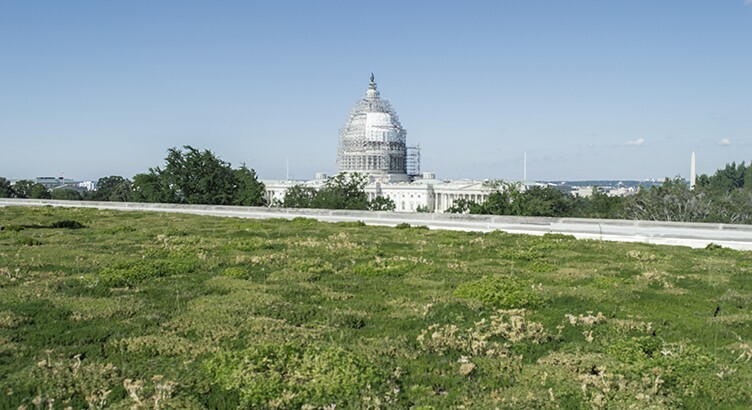 This project qualified to be part of D.C.’s RiverSmart Rooftops program which provides financial incentives to building owners who install a green roof. The program has grown expansively and now includes more than 2.3 million square feet of green space.